In the 1960s, Lynn Morey had the vision to develop a parcel of property on the west side of Lake Sparkman 7 miles south of Brooksville, Florida. He divided the land into 300 separate sites, 240 sites for permanent residents and 60 sites dedicated as a recreational vehicle (RV) campground. Later the high demand for this unique rural location and the popularity of our community led more people to seek out permanent residency at Camper’s Holiday, and the 60 camping sites were filled with permanent residents. Consequently, a new area was approved for development as an RV campground. The project was envisioned with you in mind and resulted in 66 paved, spacious campsites nestled comfortably beneath the trees. Since that day, for almost 50 years, our campground has been known as the “greatest camping on earth.” The unique relationship between the 300 individual owners and campers in the RV campground means you get to enjoy well-kept and upgraded amenities year round. Many of our first-time guests plan to spend one or two nights, but after experiencing our friendly community combined with the location, amenities, activities and quiet atmosphere, they quickly extend their stays and/or plan their return visits. We value each guest who makes their way to our campground and we work hard to ensure our campers’ experience each visit as a special holiday. During our early years our friendly bear, Campie, became our mascot and logo. 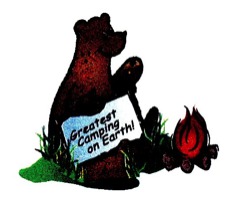 While many things have changed through the years and updates have occurred to our campground and Campie Bear, our spirit remains the same. We at Camper’s Holiday look forward to each guest and work to ensure they experience the greatest camping on earth!